Houses were evacuated in the east coast resort of Filey after flash flooding left 3ft (0.91m) of water in homes. 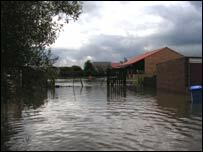 North Yorkshire Fire and Rescue Service received about 60 calls from residents and businesses relating to flooding. Meanwhile, the RNLI were called to help a group of elderly people who were stranded while using Filey School's swimming pool when the downpour hit. Coastguards went to reassure a group of older people stranded in a seafront shelter as the flood waters rose. The town's inshore rescue boat helped eight people from the swimming pool at Filey School after the torrential rain left water waist deep in some parts of the town. Coxswain Barry Robson said: "This isn't the sort of rescue lifeboat crews normally carry out, but it is clearly an emergency situation and our RNLI equipment and training means we are well suited to help out. "We'll be working with the Coastguard and fire and rescue teams on scene to do everything we can for the people affected." Fire service officials said much of the town is affected by the deluge and traffic had been brought to a standstill. Some residents who had been evacuated were being cared for at the town's Evron Centre. In a statement Scarborough Borough Council said: "The council's emergency planning officers are on site in Filey assisting with the initial rescue effort together with the emergency services and the council's own Highways and Street Scene services. "The concert hall at the Evron Centre has been set up as an emergency venue for residents who have had to evacuate their homes. "The hall has been equipped with camp beds and also boilers to provide hot drinks for flood victims." The council's main call centre on 01723 232521 will be open to give advice and assistance to all callers. 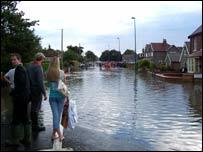 A North Yorkshire Police spokesman said: "Filey has been hit by flash floods following a cloudburst at about 1345 BST." The town centre was flooded and residents in Rutland Street were evacuated. The main A1039, and all other routes into the town, were closed, the spokesman added. Police were warning drivers to be careful of "very deep" standing water on major and minor roads.